On Father’s Day weekend I was tooling around town listening to the radio and a song by Stain’d came on called “Been Awhile.’‘ I remembered that my son Zak had sent me a link to that song many years ago because a) he liked it, and b) it had been awhile since we had seen each other. I thought the timing was so great that I just had to text him to tell him of the coincidence. Here it is…naughty words and all. Monday the 13th – CLIFTON’S BIG SCREEN DEBUT! – In the morning I went to another session for “The Garfield Show” at Buzzy’s in Hollywood. I took my friend Amanda along and she had a great time watching the craziness ensue. Afterwards Frank Welker (the greatest living male voice actor…in my opinion) did the voices of Scooby and Fred for her. She loved it! I headed back home and got ready for “The Tonight Show.” When we finished the taping I went back home, changed into my orange paisley tuxedo and blue ruffled tuxedo shirt, gathered the gang and headed into Hollywood at the Egyptian Theatre to see a screening of the new Tony Clifton feature film called “Tony Clifton Live on the Sunset Strip.” It was culminated from the series of shows he did at The Comedy Store a year ago last May. It was vile, vulgar, offensive, obscene and wonderful! I laughed just as hard as I did when I saw the original show at the Comedy Store. We went to the after party down the street on Hollywood Boulevard, but it was so smoky I had to take off. Then Kristy, Amanda, Sara and I headed over to DuPar’s and had a late dinner with Chuck McCann. What a day! WHEW! But it was to be a very short night! This shot was taken after the movie screening. 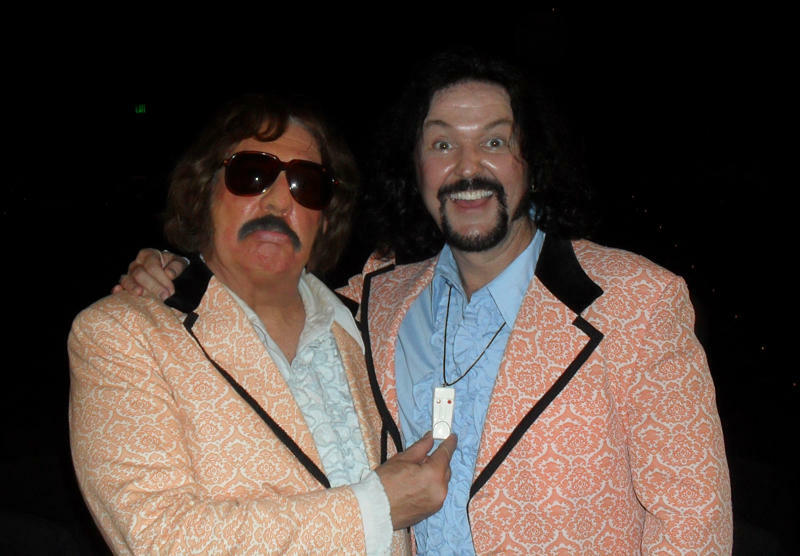 Tony Clifton is amazed that I have an official Tony Clifton medallion…as seen in his Carnegie Hall appearance back in the late 70’s! Thursday the 16th – NAP RELATED INJURY! – I got up and headed to Voice Trax West once again for more IVR work. Today we were doing fragmented sentences. Apparently, the editors for this project can extract needed syllables from what I say and input them into the computer. So I was saying a lot of nonsense stuff, only so they could extract the needed syllables for the system. Fascinating stuff! Unlike any other voice-over job I’ve ever done. (Which is why I wanted this job in the first place!). I finished up, went home to walk Sassie (who’s been doing well, by the way.) and then headed to Taco Bell to get some lunch before my next acupuncture appointment. But when I got there I found out I didn’t have enough time for a full treatment. I thought it only took 20 minutes, but apparently the doctor said 40 minutes and I misunderstood her. But we did it anyway. She wired me up and put the electrodes on. I HAVE to take my camera sometime and get a shot of me all wired up with the pins in my head. WILD! Maybe it’ll be my Random Photo of the Week sometime! I got to NBC just in time to tape “TTS”, and then went home to relax. My pal Edi came over for awhile, and then I took a nap on the couch. But when I woke up..OUCH! There was a severe pain in the upper right corner of my back. I must’ve slept wrong on the couch. Later that night I drove to Denny’s to pick up some food to go, and I realized how sore I really was. Looking over my left shoulder to check for traffic hurt like heck! Later that night I watched the two part introduction of The Bionic Woman on “The Six Million Dollar Man.” And then I slept…CAREFULLY! Saturday the 18th – FUN ON THE WESTSIDE! – I went to see my old friend Dr. Patt in his office in Santa Monica. Then I decided to hit some of my favorite Westside places. I ate a delicious lunch at Campo’s, then went to Laser Blazer to look at new DVDs. But they had SHRUNK! They remodeled their store into about a third of what they used to be. I didn’t find anything I needed so I went to It’s a Wrap to look for clothes. I found a great shirt and a pair of black suede Hush Puppies for only 20 bucks! They’re exactly like the blue suede shoes I bought in Memphis! Then I enjoyed a nice relaxing drive home. I took Sassie out then grabbed a quick nap before movie night. We watched “Monsters Vs. Aliens” and “Piranha.” We started talking about celebrities in voice-over and I realized something. While producers think that celebs will enhance the animated character, sometimes it can work against them. If, for example, you don’t particularly care for the celebrity, that can color your opinion of the animated character. And then instead of getting into the character, all you’re seeing in your mind’s eye is the annoying celebrity and it can ruin your experience. A DIStraction instead of an ATTraction. “Piranha” was campy, bloody and fun! I loved it! Later that night I sewed a Mickey Mouse Club patch on to a cap I bought at It’s a Wrap, watched “Six Million Dollar Man” and then went to bed. Sunday the 19th – SASSUPUNCTURE! – It was a nice, cool and overcast day. Sassie’s acupuncturist showed up to do her acupuncture, I did some work around the house, then I got some more sleep before evening church. After evening church I went back to the jacuzzi to work on the pulled muscle in my back, which was feeling much better. I did some work around the house, did a bunch of auditions to e-mail to my agents, then went out to get groceries. I love going to the grocery store late because it’s not as crowded. Then my pal Sara and I watched the amazing two-part “Six Million Dollar Man” episode called “The Secret of Bigfoot!” WOW! And how was YOUR week! !